Description: It's Cait Morgan and Bud Anderson's wedding weekend and the Wales castle that seemed so romantic in October is quickly turning spooky in stormy December. When a choir master takes a fatal fall and the storm causes a bridge to wash out Cait begins to worry that maybe the spooky Wales castle could be lethal. 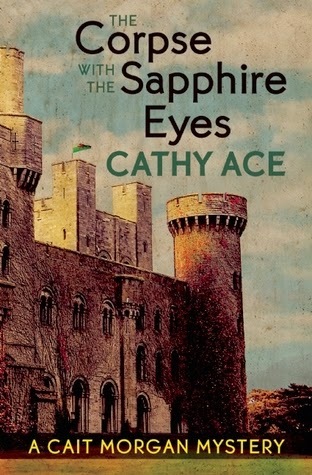 Why I Picked This Book: The setting is a castle in Wales! There's no way I could pass that up! My Impression: This was an interesting mystery in a fantastic setting. The castle was so richly drawn that it was almost a character and like Cait's sister I thought it sounded fantastic for exploring though I wanted to do the exploring myself and not wait for the children! I loved the castle treasure plot tie in. I love secret treasures and throw that in a castle and I'm happy girl. I liked Cait and Bud and the inhabitants of the castle were interesting though not necessarily likable. This is the 5th book in the series but I had no problem following who was who and there was enough explanation to understand how Bud and Cait got together without weighing down the plot. The pacing was a bit uneven at times and while there is a death that occurs early in the book it occurs off screen and doesn't really get talked too much about until a few chapters in. The book also leans towards being heavy conversation heavy which contributes to the somewhat slower pace. Cait is a psychologist who focuses on the criminal mind and Bud is a police detective so the fact that they are investigating fits. Overall, I found this an interesting mystery in a fantastic setting and I'm looking forward to getting to know Cait better. Would I Read More of this Series/Author? : Yes. While this is isn't a series that is going to the top of my TBR I am looking forward to reading the first books in the series and seeing what comes next. Would I Recommend this Book? : Yes, if you enjoy mysteries I think you would enjoy this - especially if you like cozies with a more mature main character. I love the title and the premise for this book! Thanks for the opportunity! I love it when the setting could considered a character all by itself. And a castle to boot! This does sound like something I might like. The characters professions caught my attention too. I want to know more about them. the Corpse With The Sapphire Eyes. 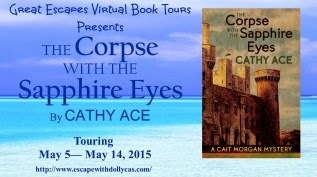 Nice review, I love cozy mysteries and castles! I will check this series out. Mystery and castle....the perfect combo. I'm glad you like the sound of it Verna - I tried to make it fun ;-) Apologies for the delay in responding - I couldn't work out ow to use technology to my advantage! I enjoy this series and I need to catch up with it. I'm a little behind. Hi Yvonne - I'm so pleased to know you enjoy the series - maybe now's a good time to jump back in ;-) Apologies it took me so long to overcome my technically-challenged idiot self! I'd like to read a mystery set in a castle. And here's your ideal opportunity, Michelle! Hope you enjoy it if you read it...and sorry it took me so long to work out how to reply!